Some of us love to make our own homemade natural cleaners. 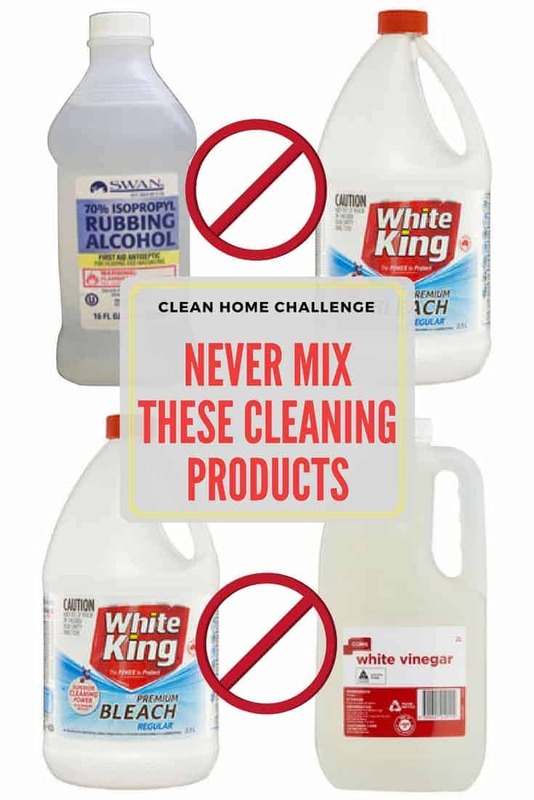 Did you know that there are some ingredients in these cleaners that you should NEVER mix together! Mixing certain natural cleaning products can give off toxic fumes and may even be life threatening. If you have already tried one cleaning product, but it didn’t work, you should NEVER apply another product directly after it. Either rinse it off, then try again. Or wait for it to completely dry. Also note, that sometimes trying to make a cheaper homemade cleaner, just isn’t going to cut if for some cleaning jobs in the home, and is NOT worth the health hazard it may come with. Always read the label! Most manufacturers do not list their active ingredients on their labels. Always be sure to rinse the area well then let it dry before using other products on or in the same spot. Allow adequate ventilation. Turn on fans, exhaust fans and open windows when cleaning. Whilst this does not stop lethal combinations, it does keep safe cleaning mixes from becoming irritants. Grab the printable guide below. The chlorine in bleach reacts with the acetic acid in vinegar. The result is chlorine gas, a compound so powerful that it can really be harmful to your respiratory system. Chronic exposure to relatively low levels of chlorine gas may cause pulmonary problems like acute wheezing attacks, chronic cough with phlegm, and asthma. Chloramine gas causes many of the same respiratory problems and blistering described above. Many glass and window cleaners contain ammonia, so never mix those with bleach. Bleach contains sodium hypochlorite. 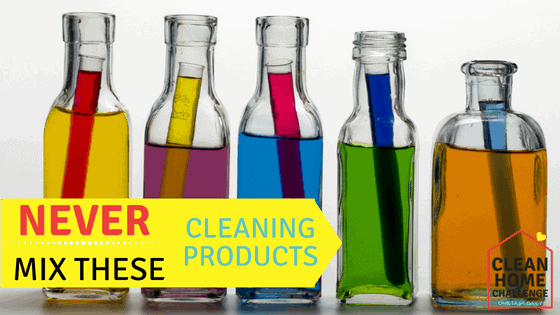 Rubbing alcohol contains ethanol or isopropyl alcohol. The combination produces chloroform. Yep, the same stuff kidnappers on TV use to knock out their victims. A quick google search for “natural bleach” will tell you to mix hydrogen peroxide and vinegar. It may do that, but only because it creates peracetic acid, a highly corrosive liquid. While this reaction is used in some commercial laundry products, it’s done in a controlled manner which has been safety-tested. DO NOT mix it at home. Vinegar is acidic and baking soda is a weak base, so when they’re mixed together they react to neutralise each other. This produces mostly water and makes the solution almost useless. But the most dangerous thing is that the combination can cause an explosion if you mix them in a closed container. Although these pantry staples are handy on their own — both baking soda and vinegar can help clean items throughout the house, you should skip any DIY cleaner recipe that involves this not-so-dynamic duo. Grab today's printable, and get access to all available worksheets & printables in my resource library, along with one cleaning task each day! Success! Now check your email to download your printable.